We couldn't be happier with our experience working with Dana. We found her down-to-earth and professional. She is intelligent, sensitive and totally accessible. We found her advice to be practical with immediate positive impact on our daughters. We also liked the fact that while she addressed our concerns she didn't create issues or cause us to worry unnecessarily. Overall we would recommend Dana without reservations. She is terrific! We enlisted the expertise of Dana Rosenbloom when our daughter started Kindergarten. There had been a significant amount of change in our family prior to her starting in a new school and these changes, along with her strong personality, began to affect her behavior in the classroom. Dana was so wonderful and patient in her play sessions with our daughter. It was immediately clear that she was highly skilled in the area of early childhood behavioral development, and her approach with our daughter was incredible to watch. We began to see an easily frustrated child start to identify her emotions and use the very kid-friendly tactics she learned on her "play dates" with Dana to calm herself down and return to the tasks at hand. Dana was also extremely creative in mixing up her approach to connecting with our daughter when necessary (i.e. : taking a walk outside, going to the park together), and a huge advocate for our family during what could have been a difficult situation to navigate with our daughter's school. Overall, working with Dana was a pleasure and such a positive experience both for us and for our daughter. She is a tremendous asset to any family she works with. I first met Dana at a potty training workshop. She was accessible, friendly, funny and incredibly PRACTICAL. I reached out to her after the workshop to get her advice on potty training and on a big move we were about to undertake as a family--a physical move to the suburbs and my return to work. Her advice helped make our transitions very manageable for our nearly two-year-old son. Since then, we've reached out to Dana on a number of issues--everything from moving our son to a big bed to him becoming a big brother. Her strategies for introducing the topic of my pregnancy to the first weeks home with a new family member were phenomenal. She also helped us with sleep training our daughter. My son, now nearly 6, actually said the other day, "Mom, you're really frustrated with the way my sister is acting. I think you need to set up some sessions with Dana so that she can help you." He was right! She has been and will continue to be an invaluable resource for our family. As parents, we all want to know, "Is my child OK? Am I doing this parenting thing OK?" Dana answers these questions with warmth and compassion. She meets you where you are and helps you get to where you want to be. She's a gift of a person and I am so grateful to have her in our family's corner. We love Dana! She helped us immensely with finding the right words and approach to speak with our toddler son. Her advice was extremely effective and positive; she asked the right questions and provided HELPFUL answers. My husband and I had a terrible experience with a doctor who made us feel like we were doing everything wrong--Dana was the complete opposite. She empowered us to be great parents--and best of all, she laughed with us along the way. I would recommend her to anyone! At a little over 2 years old, our child was not speaking and preschool interviews were not going well. We had our child evaluated by a developmental pediatrician. Completely overwhelmed with the evaluation process and recommendations of OT, Speech, Special Instruction and more, the doctor referred us to Dana Rosenbloom of Dana's Kids. It is not an exaggeration to say, Dana came to our family's rescue. She asked us the key parental questions the doctor did not, such as, how were his eating habits, play skills and bedtime routines going. She taught us as parents to meet our child where he was, and not where he "should" be according to any toddler book or age. She managed our team of therapists to make sure our child was getting all there was to get out of all of the services needed. She has held our hands and supported us as a family and as only a compassionate Special Instruction and Behavioral Therapist could. Most of all, she brought out the best of our child that he is and continues to be. She has worked tirelessly to bring about skills, socialization, motor planning, imaginative play and direction following for our child. Dana is gifted beyond words and if you find that your child is struggling or if you are questioning if your child may have challenges or delays, seek her out. Dana changed the course of our child's future and our family life for the better. We contacted Dana after our son’s nursery preschool mentioned concerns about his development. We were nervous and overwhelmed. He was almost three years old and he was barely speaking, walked on his toes and wasn’t interacting and playing with the other children as he should have been doing at that age. Dana met with us, spent time with our son, referred us to a top developmental pediatrician and assembled a team of extremely skilled therapists to help him. She also advised us on applying for services through the state so that some of these services would be covered. For the next two years, Dana worked with our son both in our home and in his school developing his play and social skills. She facilitated weekly play dates with other children and taught our son the social skills and play skills that came naturally to other children. Three years later, I’m happy to report that my son is in a mainstream elementary school and his teachers have told us that he is a model for other students, both socially and academically. They have no idea of his past. Thank you Dana! We couldn’t have been here without you! When we realized our son was not typical we felt lost and overwhelmed. Dana helped us organize his needs and helped us create a plan. She also worked with our son weekly. It is amazing to watch how much patience and intuition she has with children. She also guided us as parents as to what would be the best fit and resources for our son. As he continues to grow, we continue to use Dana as a resource and when times get confusing and overwhelming she will strategize with us on what makes the most sense. At every stage of development Dana knows what to do. She is an amazing therapist and listener. She never jumps to conclusions but listens first and then reacts. Every time she would work with us she always came ready to work and jumped right in to whatever needed to be done. She continues to be an amazing resource for us, our child and our family. 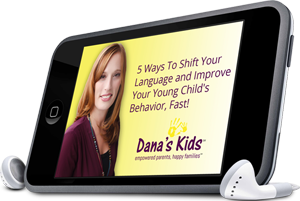 Dana has a rare gift of being able to work effectively with both children and adults. While our family was going through a crisis after my wife's horrible car accident, she quickly and intuitively knew how to make our small child feel safe and return to a normal routine during an otherwise chaotic period in our lives. Dana was also able to pass on her skills knowledge and confidence, teaching us how to handle our daughters fears and concerns on an ongoing basis until, thankfully, they disappeared. Dana has a unique gift as a child development specialist and educator. She's terrrific with children, a good listener and patient. When working with our family, she helped us identify ways to assist in our children's development by providing very specific and appropriate solutions. I would highly recommend her to any family looking for external support in early childhood development.